Nations pledged to work together to improve the efficiency of energy-guzzlers from televisions to cars, showing practical cooperation on climate change despite a deadlock on sealing a treaty. Senior officials from economies that make up more than 80 percent of global gross domestic product agreed on 11 initiatives during talks in Washington, which betrayed none of the sharp divisions typical of climate negotiations. 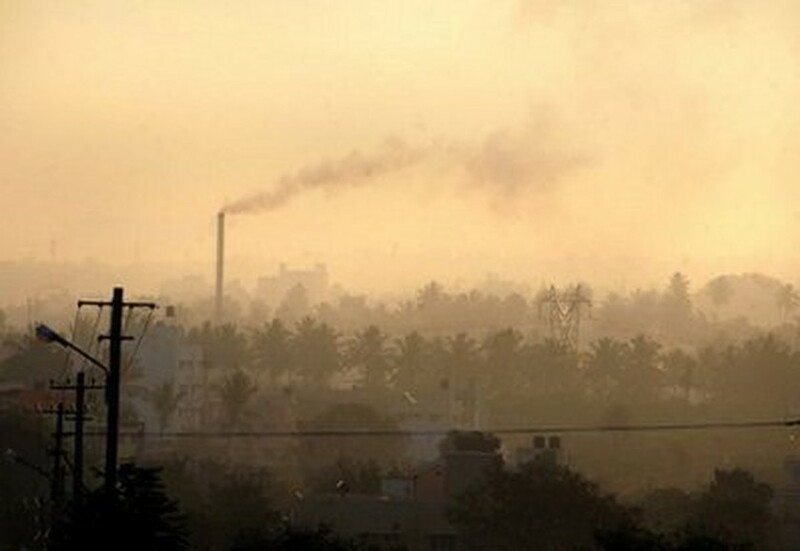 A factory chimney in a residential area emits smoke as haze casts a blanket over Bangalore, India. US Energy Secretary Steven Chu, who led the meeting, said Tuesday that the clean energy projects would eliminate the need for more than 500 mid-sized power plants around the world over the next 20 years. "This is about taking concrete action and concrete steps. This is not about philosophical positioning," Chu said after two days of talks among 21 nations including key emerging economies China, India, Brazil and South Africa. "Yes, we have to deal with international agreements, but we can't wait for those to move," Chu said. "We know the energy challenge won't wait, and we won't wait either." While the two-day talks were not designed to pledge funds, Chu said that the nations together have invested "hundreds of millions of dollars" in developing green energy, and several states said they were boosting resources in research. One key initiative will look at ways to improve the energy efficiency of home appliances such as televisions, which the US Energy Department estimated would reduce the need for about 80 power plants by 2030. A number of nations will participate in the appliance research, including the United States, Japan, South Korea, India and European nations. In another initiative, Britain and Australia promised to take the lead in accelerating work on so-called carbon capture and storage (CCS) -- which lowers the output of carbon, which is blamed for global warming, from power plants. CCS is considered crucial for the future of coal, which provides more than one quarter of the world's energy supply and is politically sensitive in major polluters such as Australia, China and the United States. "We have literally only 10 years to scale up and deploy CCS globally," said Chris Huhne, Britain's minister for energy and climate change. "Each year of delay will lock in an increased amount of old technology which we won't get rid of," he said. Another project, which includes major governments and corporations, will look at ways to collaborate in design efficiency standards for large buildings including factories -- which account for more than half of global energy use. Nations also agreed to exchange notes on one another's pilot programs to develop electric vehicles, as well as to coordinate in designing so-called "smart grids" that manage community power consumption. The United Arab Emirates said it would host follow-up clean energy talks in early 2011, with Britain holding a third meeting at a later date to be determined. The talks, an offshoot of the US-led Major Economies Forum, include both rich and emerging nations but not smaller states such as Sudan and Venezuela whose strident criticisms dominated parts of December's Copenhagen summit. Kandeh Yumkella, director general of the UN Industrial Development Organization which champions the economic uplift of the world's poor, said rich nations still needed to follow through on commitments at Copenhagen to offer 30 billion dollars through 2012 to help poorer nations cope with climate change. But he said that the Washington meeting should offer hope to developing countries. The world's energy demand is estimated to jump by nearly half in the next 20 years, fueled by the developing world. "If they decide to produce, use and consume energy the same way as the US and OECD (developed) countries have done, we will not be able to deal with climate change," Yumkella told AFP. "What this meeting does is to send a message that there are things we know already how to do. They are practical and we can deploy them now."